The Rotary Club of St. Thomas II installed its 39th President and Board on June 28, 2017 at the Aqua Terra Oceanfront Grill, Marriott Frenchman’s Reef and Morning Star Resort in the presence of approximately 60 Rotarians and friends and family of Rotary. The installation of President Peggy Simmonds was a touching ceremony of transition and continuity for Rotary II. She took the oath to lead the largest Rotary Club in St. Thomas/St. John and to move forward by strengthening Rotary II projects, programs, and partnerships and by building essential resources for the support of the future of Rotary, the so called “New Generation clubs” – EarlyAct, InterAct, and RotarAct. The program was guided by Past President Eleanor Thraen and enlivened by songs from Past President Lorraine Baa and renowned musician Louis Taylor. Sergeant at Arms, Past President Al Laborde kept order and made the event even more fun for the participants The 2017-18 Board of Directors all pledged to support the tenets of Rotary and to help President Peggy and the other members of Rotary II to continue to serve the community. The 16 members are: Kirk Callwood (President–elect), Albert Richardson (Vice President), Pierina Feldman (Secretary), Welby Warner (Treasurer), Kenn Hobson (Immediate Past President), Alphonso Laborde, Jr. (Sergeant at Arms), Lorraine Baa, Horace Callwood, Shaniece Charlemagne, Conrad Francois, Marie Hermann, Cassandra Mallory, LaVerne Ragster, Ludence Romney, Edward Thomas, and Sinclair Wilkinson. 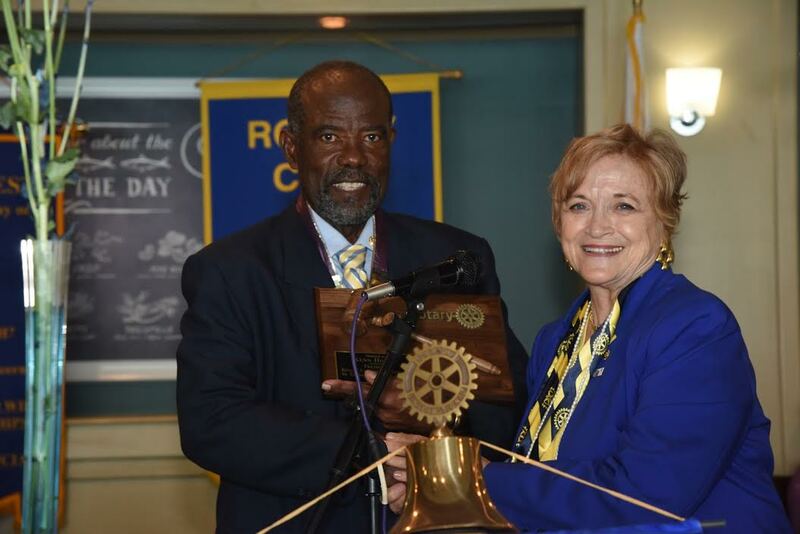 President Peggy is a long-term resident of St. Thomas that brings a background of experience in service from the Peace Corps, the US civil rights movement, Inner Wheel, the Virgin Islands public sector, and Rotary II Board to her year of leadership of Rotary II. It will be her responsibility, with the help of the Board and the membership, to fulfill the Rotary motto ”Service Above Self” through Club projects and activities that benefit the people who live in our community.